ART SHOW & AESOP ROCK AT SAC STATE TONIGHT! Thursday, Nov. 3, 2011 is a great day to be hanging out on the campus of Sacramento State, whether you’re a student or not. 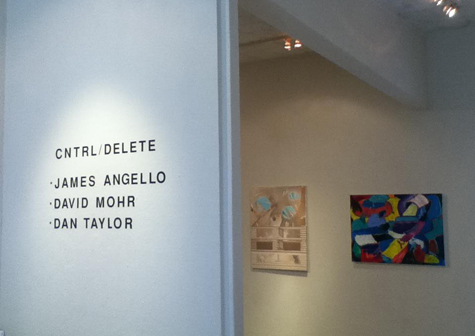 First, check out the closing reception for the art show CTRL/DELETE: Paintings by Digital Natives, featuring recent work by James Angello, David Mohr and Daniel Taylor at Witt Gallery (located in Kadema Hall) from 6 to 8 p.m. Mohr, who is in the local band FAVORS, recently told Submerge that he and Angello thought up the idea for the show. “We are both interested in what it means to paint and draw in a world dominated by computer technology, so we decided to put together a show that would discuss that concept,” he said. They were familiar with Taylor’s work (“We have all had art classes together,” Mohr said–the three are now seniors at Sacramento State), so they reached out to him and it became a three-person show. “All of our work is very different,” Mohr elaborated. “My work mostly focuses on abstract geometric forms, but I try to use familihttp://submergemag.com/wp-admin/media-upload.php?post_id=4726&type=image&TB_iframe=1ar shapes to reflect on the experiences and methods of interaction shared between humans and evolving electronic technologies.” If you miss the reception on Nov. 3 you’ll have to rush to see the work, as it is only viewable until Friday, Nov. 4, 2011. After you check out the art show on campus, head over the Union Ballroom and check out one of the hottest hip-hop shows all year, featuring Aesop Rock, Rob Sonic and DJ Big Wiz. The concert also features special opening guests Jel and Who Cares. Show starts at 7:30 p.m., is $15 for students and $20 for general public.